When people want to be noticed, they create a statement look which usually falls alongside the lines of fashion. Chanel does this perfectly in their fashion week look. The vibrancy in the look helps put together the perfect statement makeup look that can stop people in their tracks anywhere. However, you can create that same statement with a simple makeup look. You can stand out with your eyes and keep it classic elsewhere. Here’s how to create the perfect blue statement look that Chanel has graced us with. 1. Base: Fenty Pro Filter Soft Matte Foundation, $34: Fenty’s Pro Filter Soft Matte Foundation is a comfortable matte foundation that helps control shine. It comes in a range of shades and undertones that pair well with the look. The foundation itself is an oxidizing base product so the requirement for wearing this product is to let it sit before applying other products. You can see the base the model is wearing is a matte finish, as there is no visible shine to her face. Pro Filter’s Matte is a lightweight finish, it doesn’t feel heavy nor dry upon the skin. 2. Eyes: Natasha Denona Eyeshadow Palette 5 in “Color 7”, $48: The bold blue eyes are what creates the statement in this look and for that, a pigmentated eyeshadow palette is needed. Natasha Denona’s Eyeshadow Palette 5 in the Color 7 is the perfect formula and color scheme to create this look. You’re able to create a perfect blue smokey eye while using one of the grays to help darken it just like the model. 3. 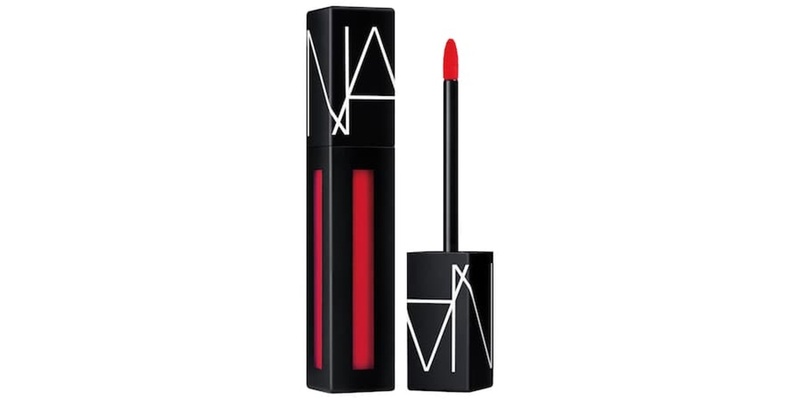 Lips: Nars Powermatte Lip Pigment in Color “Light My Fire”, $26: This color matches the red on the model perfectly as they are both bright red lipsticks with an orange undertone. Liquid lipsticks usually are drying and often crack throughout the day, the feel of it can be quite uncomfortable but the Nars one doesn’t do that. Nars Powermatte Lip Pigment comes with a small tip applicator that helps create a precise and smooth application upon the lips. A precaution for the product is to shake the bottle well: as the product itself has a watery consistency. Through this consistency, the product helps create a lightweight feel upon the lips and an even layer upon itself. 4. Blush: Makeup Forever HD Blush in Color “Coral”, $26: An orange/pink blush ties the look together. It helps soften the boldness of the look while adding color that lacks upon the cheeks. Coral is a subtle color whose vibrancy helps create a natural, flushed look. It all depends on the skin tone it is used with. However, Makeup Forever HD Blush is the best as it is buildable and doesn’t crack the pigmentation with the more product that you put on. It helps create a natural intensity without making your face look caked up with makeup. 5. Highlight: Farsali Jelly Beam Illuminator, $40: Although the model itself does not have highlight on, highlighter helps pull a dramatic look together. Farsali’s Jelly Beam Illuminator gives you the perfect control over a highlighter where you can either create a soft look or an intense look. The product comes in three different shades which all have great pigmentation to build a look together. The product dries down as a powder, so the dewy application does not stay throughout the day. A statement in different aspects helps you make your mark on the world. If you decided to go bold on the eyes, on the lips or create a bold look in general, you are certain to catch eyes. Chanel’s blue eyes are stunning and help capture the importance of standing out in society. For those who intend to stand out and chase their dreams, a daring look such as this one will help.